Previously spread over multiple small floors on Fanshawe Street, Tower decided to consolidate onto five large floors on Queen Street, with the idea of moving customer facing services further up the building, taking full advantage of the views, and partnered with Creative Spaces to design a new fit-out with a strong focus on future flexibility. Subtle theming over the five floors developed from the Tower brand. It became apparent that 'The Lighthouse' only functioned successfully with the help of support buildings. This tied in nicely with the teams and facilities of each floor. It was important that should the brand change at all, the fit-out would still be relevant. 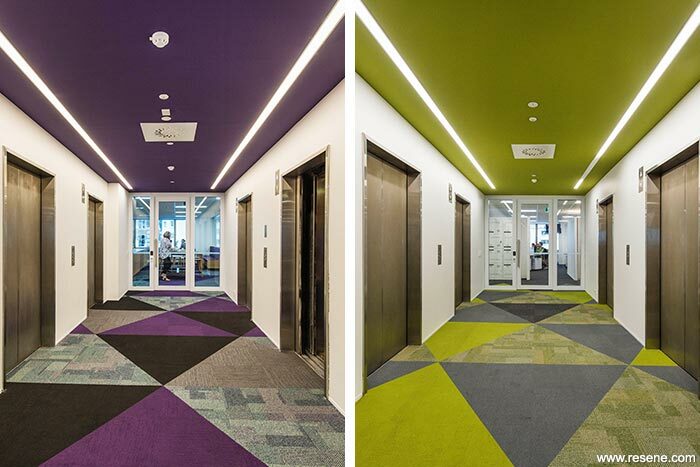 A colour palette was established which assisted with wayfinding and gave each floor its own identity. Interest and depth was created with the use of faceted carpet transitions, a variety of light fittings, finishes and textures. Every person within Tower, from the CEO down, changed into an open plan environment. 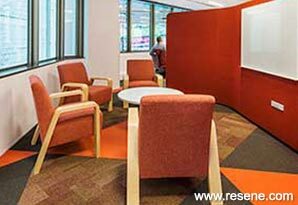 This was supported by an increased number of quiet rooms, collaboration spaces and bookable meeting rooms. 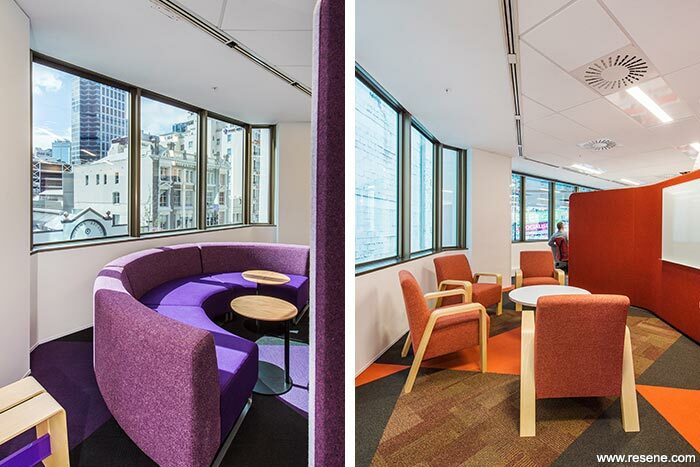 The traditional 'Corner Office' was changed to open collaboration space which the whole organisation could share and enjoy. 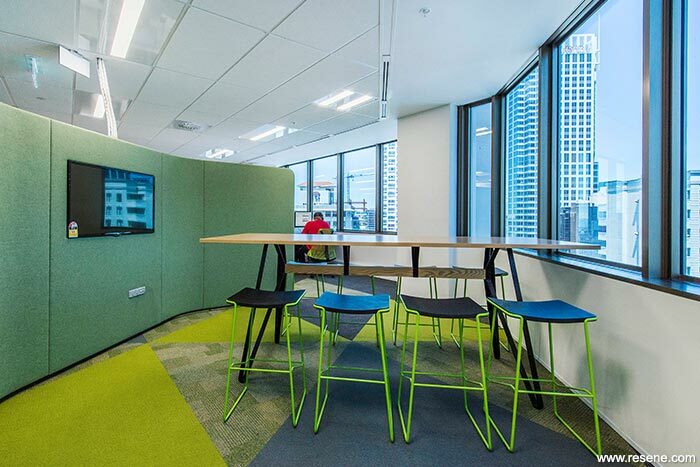 While the workpoints are currently all allocated to individual employees, the interior is designed so that Tower can transition to flexible shared desk allocation in the future without any change to the fit-out. Resene Alabaster (blackened white) was chosen as a fresh neutral base for all floors. This was contrasted with strong bright colours on the ceilings in each lift lobby that reflected the theme of the floor – the Boathouse – blue (Resene Limitless (azurite blue)), The Keeper's House – green (Resene Kombi (mustard brown)), The Signal Building – purple (Resene Wicked (deep indigo)) and The Fuel House – orange (Resene Whizz Bang (bright orange)). By having the colour unexpectedly on the ceiling a strong sense of arrival was achieved. 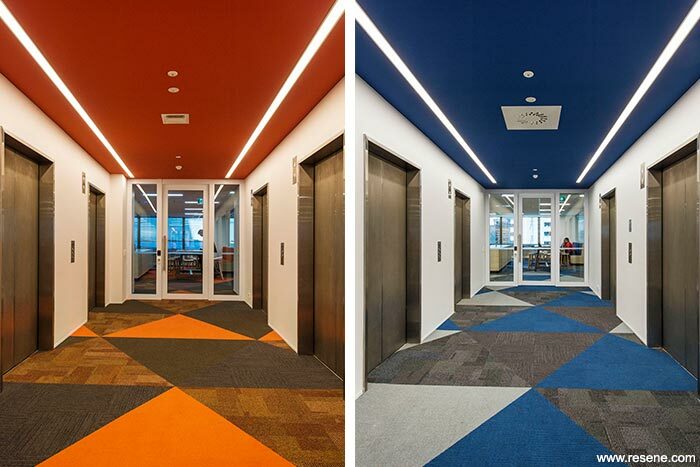 This was reinforced by the faceted carpet that echoed the same colour tones. In the reception area on Level 14 it was decided to reuse the previous tenant's beautiful travertine tiled floor and oak wall panels. Resene Villa White (smooth yellow white) was chosen to complement these existing finishes and create a warm inviting environment for visitors. Resene Ship Grey (mid grey) was used as a semi-gloss finish on the internal solid core doors, with Resene Quarter Stonewall (brown earthy neutral) on bathroom doors. Both are robust colours for areas of high use and tied in well with the general carpet finish.